A standard procedure. Will Apple play its cards right in the battle of the nano-SIM card standard? Ante up boys. Never watch sausages, laws, or telecommunication specification being made: it could get ugly. The standards creation process is as much about politics as it is about technology and interoperability. Some companies play that game, others decide to go their own way when possible. And for Apple, proprietary has often worked so well. Considering their incredible influence across the wireless telecom ecosystem, Apple has never been big into standardization. If the mobile industry were a game of poker, the level of standardization participation would be a solid tell about a company’s hand. But Apple isn’t so easy to read, and may even bluff at times. Back in 2004, if my memory serves me correctly, I noted to anyone that would listen that Apple was a member of the CDMA Development Group indicating that Apple was not only developing a handset, but almost certainly working with Verizon to create a CDMA phone. But when Apple finally showed their hand, it was a GSM phone that would change the industry. What a flush. While Apple has been very active within the World Wide Web Consortium driving its influence in HTML5 standardization, in more traditional telcom spec making bodies, Apple tends to be a no-show. So stories about the on-going battle for thew new nano SIM-card standard within ETSI are significant. Subscriber Identity Module cards are no small matter. There are more than four billion SIM cards in active use across the globe, and most GSM and 3G network users have one. Heck, in dozens of markets the average high-end subscriber is likely to have several. For operators, SIM cards act as a secure identity link to their customers. Going forward, SIM cards are likely to get smarter and play a key role in secure mobile commerce. In sticking with a poker metaphor, Apple has now upped the ante by promising that if their nano-SIM card proposal is accepted as an ETSI standard, it would offer a royalty-free license to others (Apple offers “an unequivocal commitment to grant royalty-free licenses to any Apple patents essential to nano-SIM.”) Given the potential volume of SIM cards is in the billions, this is no nano offer and could alter the stakes, especially for SIM card makers and operators. Some are questioning whether Apple is playing a fair hand in the game. Apple has registered several of its subsidiary companies as voting members in ETSI. But to be fair, this strategy is not unprecedented at the spec-making table. Later this week we will learn the winners and losers in this card game. Do tell. 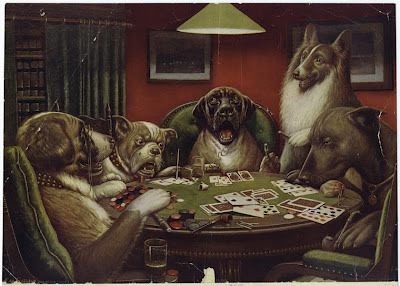 “Dogs playing Poker” by C. M. Coolidge. Standards making can be a dirty game. In making the new nano-SIM card standard, will anybody call Apple’s bluff? Kinect, with style. Playing dress-up with Microsoft. Will Kinect be the new Mall of the America? Is this the prefect fit? The Kinect and online shopping? The ability to scan real-world images is being taken to new dimensions thanks to devices like Microsoft's Kinect. And thanks to the recently released Kinect SDK, we're beginning to see the Kinect grow in all sorts of directions. So, here's an interesting use case for Microsoft's Kinect: the virtual dressing room for augmented dress rehearsals. Try on clothes, have them sized, and have them dyed -- all in the comfort of your living room. Here it is! Nokia’s amazing tablet concept! See it here, now! PIC! Apologies for the misleading tabloid-style header. But there are no lies here. Only facts and memories. I’ve touched upon this Nokia concept device a number of times only because I find that it tells an interesting story about vision, innovation, and credit. Rarely do new products pop up out of the blue. All inspiration has a history attached. 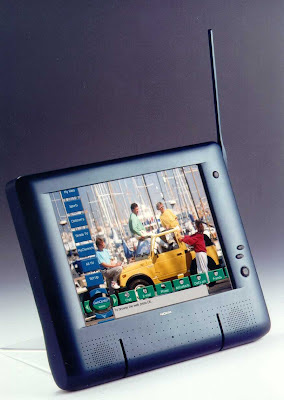 Before the turn of the century (August 1999 at the IFA exhibition to be exact), Nokia introduced a working tablet prototype that drove tech journalists and open-source fans wild: a large, connected touch-screen device based on Linux. Users could surf the web, write e-mails and chat, and even catch the game via its built-in digital terrestrial receiver. All content was equal. The word "convergence" was all the rage at the time, and Nokia just redefined the term. The device, known as “MediaScreen,” ran a UI layer Nokia called “Navibars,” which was in essence, an advanced and flexible menu system. Users could create bookmarks to television stations just as easily as they could to a website. Users could create folders which could hold broadcast links, web info, photos, and applications. A sports folder, for example, could contain videos of little Johnny’s football match, an icon for Eurosport TV, and the latest scores from the web. And then what happened grandpa? Well, the dot.com bust didn’t help. Things became tight here and there and companies began to concentrate making-money ventures. Nobody knew how bad things could get. And the component costs must have been quite brutal at the time. But if I understand the evolutionary line correctly, MediaScreen did act as innovation for other Nokia projects and programs -- sort of a grandparent to a future generation of tablet-like devices such as the 770. Timing can be a cruel dealer of the deck. Woody Allen once said 80% of success is showing up. But it’s really showing up at the right time. And showing off. When Apple’s iPad was first introduced, I called it Laptop2.0. Now, if I am reading this news correctly, Nokia has confirmed that the company will be entering the tablet market, although few details are provided. Will this be Nokia’s own 2.0. Get ready to Touch & Hover! Is this the evolution of touch? Sony’s new “floating touch” input method hits the nail on the head. Most Android handsets look pretty much alike to me. And I don’t blame the vendors for this general lack of form factor innovation. In this game of follow the leader, there’s little reward in thinking different. But this isn’t to say there’s no opportunity to improve the block screen experience with a touch of wow here and there. Sony’s new Xperia sola is a typical Android device from a tier one vendor. 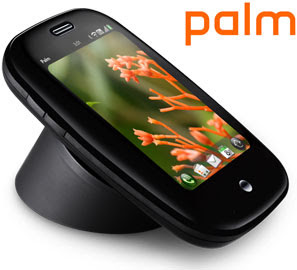 It has a 3.7-inch 480 x 854 display, a 1GHz dual-core processor, and blah, blah, blah. But Sony’s addition of “floating touch” deserves special attention that it probably won’t get. The idea of sensing by hovering has been around, but it’s nice to see what could be a sold real-world implementation. This addresses the problem of requiring a surgeon’s precision with some touch tasks, such as browsing busy pages with many small links. I suspect that “floating touch” is a feature users have been longing for. Note also the NFC SmartTags feature and accessories which allows users to easily pair and set locale customization. There are some sweet details here. Best of luck to Sony in making the show. Has Apple put OSM on the map? OpenStreetMap makes it to the big leagues with Apple adoption. Yup, street cred. In the beginning, there were two. Two major vendors of map information. It was a near-perfect duopoly. There was Chicago-based NAVTEQ and Netherlands-based Tele Atlas (purchased by Nokia and TomTom respectively). But as GPS chips became cheap and ubiquitous, the potential new business models for location-based services attracted fresh blood. So Google brought together their own map-making team. They drove and biked around and noted coordinates and WiFi MAC addresses and they even accidently grabbed a personal e-mail or two. Because Google Maps and the accompanying APIs were free and rather fun, they became the platform of choice for third-party location-based services. Foursquare and even Apple threw layers of information on top of Google Maps. But then, suddenly, the party was over. Back in October 2012, Google announced its intent to begin charging services that were piggy backing on its maps. There would be a fee for constant trespassing as of Jan 1, 2012. But there is a free lesser-known alternative: OpenStreetMap. The OSM project uses crowd-sourcing to created an open-source competitor to the commercial map platforms mentioned above. OSM started slowly back in 2004, and gained global contributors over the years. And now, according to Wikipedia, there are more than half a million OpenStreetMap contributors. While a few companies such as AOL/MapQuest, Foursquare and some smaller navigation vendors have backed OSM over the past few years, the biggest acknowledgement for the volunteer group came last week when Apple introduced the new iPad. Some keen observers noted that a number of Apple's map-related applications were no longer layering information on top of Google's maps, but rather OpenStreetMaps. Photos on places, for example, are shown on top of OSM maps. This means significant street cred for OSM. It looks like OpenStreetMap has found its way. Tongue in cheek of the week: Multi-tasking taken to the cutting edge. Thanks to Lina W for this one. Is this a late Friday funny, or a very early one? Whatever. Because this is a limited time offer, there's no time to wait. Act now! Yes folks, it slices, it dices. You set it, and forget it! How much would you pay for such a device? Don't answer yet! Use it to slice a tomato so thin, it only has one side. It's dishwasher safe, and even tells your children bedtime stories. And you guessed it, there's more. It responds to your requests, plays TV, makes calls, and can even double as a musical instrument. Slice onions. Use it as a hotplate. Paddle the canoe. So how much would you pay for such a device? $799? $899? $999? Nooo. Will modular finally click? Asus PadFone. Nice idea, but the pieces are unlikely to fall into place. Is it a smartphone? YES! Is it a tablet? YES! Is it a laptop... 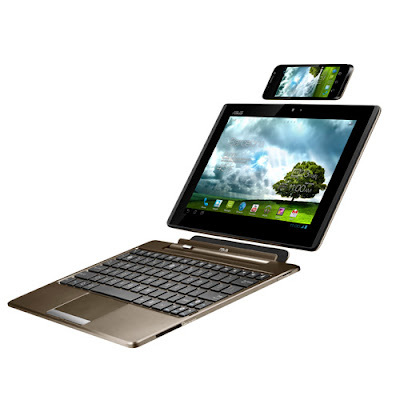 Yes, Asus' new PadFone goes for the trinity. Will modular finally click? Will the smartphone be the center of our computing experiences? The brains behind so many accessories? I've been following the modular trend for years, and most of the concepts I've seen have bitten off more than they could chew. The general idea is sweet: the mother is a smartphone, the accessories are the offspring. It's an approach that just hasn't worked, and has left many victims in its wake. Israeli-based modu, for example, had a great idea. A small mobile phone -- the world's smallest by some metrics -- would be the heart of a series of other devices. 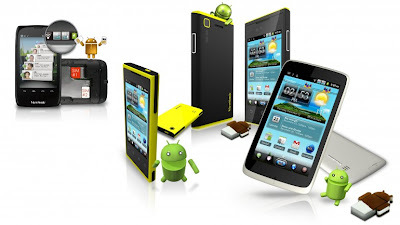 Users could personalize the features and style of the phone using what modu called "jackets" or enclosures. It was an enticing thought, but the company went bankrupt and sold most of patents to Google, which is an interesting signal as well. Now enter the Asus PadFone. An Android smartphone that fits sweetly into the back of a rather bulky looking screen, turning it into a tablet. Add in the keyboard accessory and it becomes by definition a laptop. Check the MobileBurn video below for a clarity. Asus didn't provide pricing information, and this is no small detail. The added complexities of the engineering and the connectors usually mean that the whole is greater than the sum of its parts: in other words, it might make little economic sense to the user. Asus is to be commended for its attempt to differentiate in a market full of look-alike products. At the same time I have to wonder if this isn't a solution searching for a problem which has already found a solution. The annoyances of multi-device ownership are being well addressed by cloud-based services such as Dropbox and robustly well-synced inboxes. This isn't to say there aren't synergies with this Asus approach. Connectivity comes to mind. But unless the price is right, in this age of smoother multi-device ownership and multi-tasking mentality, I don't see the pieces coming together. What the Metro North Indicator and the JetBlue Barometer are telling us: Print is running on empty. When you find a reliable, real-world leading indicator, go with it. Japanese teenagers and the general population of Singapore tend to be among the best gauges of the technology future. Unfortunately those are half a world away for me, so I have to learn to look local. I find that the next best observable thing is busy commuting mid-level executives and their offspring. My part-time vantage point is watching suburbanites commuting into Manhattan. During peak commuting hours, many of these head downtown to Wall Street or to Madison Ave to play the ad game. During off-peak hours, their offspring head into the City to become cosmopolitans. My observation is that both groups have a good track record of being ahead of the technology adoption curve. That commute into the City is an early adopter zoo where one can safely observe technology-savvy species evolve before the eyes. The Metro North Indicator works. Along the same vein, passengers on JetBlue and other lower-cost airlines tell their own tales. Couples with kids: that's where the action's at. See how they entertain. 3DS and tablets and laptops and smartphones and iPods. A decade ago such observations made it clear to me that RIM and their BlackBerry line were about to go mainstream. On a series of peak adventure rides into Manhattan, I counted that 100% of the observable passengers were glued between BlackBerry screens and newspapers. And now, about ten years later, a recent count brought the BlackBerry count to zero. The bring-your-own-device trend and worker demands has has led the iPhone and similar looking Android devices into the enterprise. But what has become very clear is that the printed newspaper is on its last leg. I'm seeing very few newsprint readers these days and lots of eReaders (including tablets). 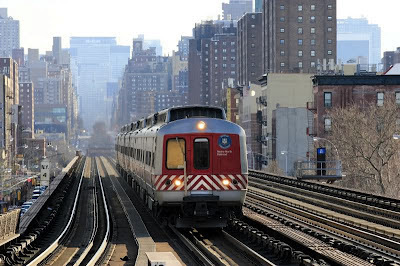 The Metro North Indicator is clear: print is on a one-way track to extinction. Tongue in cheek. More unbelievable wireless technology from Qualcomm. Qualcomm's wireless evolution. Qualcomm's WiPower. The (wireless) power struggle as the last cord shivers in fear. These are not easy days to be a wire. Everyone is gunning for you. You can smell extinction. Now the power cord will feel the wrath of development. So, wireless power transfer is the future. And it has been for the past 100 years. Yes, it was early last century when Nikola Tesla demo'd true wireless energy transfer. The first step into a wireless power world will start with some sort of inductive coupling method. This isn't revolutionary as inductive coupling has been the technology used in sealed devices such as electric toothbrushes for years. Now it is standardized by the Wireless Power Consortium under the Qi brand name and should begin its march toward mainstream soon. But there is always a power struggle with such widely-employed standardization initiatives. And Qualcomm promises something better with their WiPower technique by enabling everyday objects such as tables and counter-top to become convenient charging stations. And Qualcomm says that WiPower enables real contactless charging up to around 50mm (around two inches). This is cool stuff. Power to the people. Is the future of touch non-touch? Get ready to hover. Noalia's "Nemopsys 3D" gesture input system. Is this the end of the fingerprint smear campaign? Get ready to hover your hand. Get dual -- or be a fool. Viewsonic adds to the Dual-SIM smartphone trend. Want to bet a few major handset vendors will miss this one? In a few years from now, some top mobile execs will be scratching their heads wondering why they just lost a chunk of smartphone market share in some vital growing markets. Yes, it's time to double down -- now. So, as twain would say, "History does not repeat itself, but it does rhyme." And here we go a second time. Dual-SIM handsets were around since the mid-'90s as street vendors in Asia learned how to glue together the guts of two handsets and subscribers got clever juggling accounts. Then some no-name brands started filling the dual market demand. Most major handset vendors were late to the game giving smaller Asian vendors an opportunity to gain some share. Then Samsung came along with their DUOS feature phones which became popular in some BRIC markets. Now a similar trend is happening with smartphones. Some smaller Asian vendors introduced dual-SIM smartphones. Then Samsung came along with their Galaxy DUOS dual-SIM phone. And etc. Now here come more. Viewsonic introduced four dual-SIM Android-based smartphone at Mobile World Congress this week. Two of them are based on Android 4.0 ICS. Given the market stats of dual-SIM subscribers, there's nothing more to explain here. Recommendation to smartphone vendors: Go dual. Unlike things such as projector phone, dual-SIM will be no tiny niche. Totally mental. The thought-controlled skateboard. BCI is moving forward now. VIDEO. Here's an interesting brain-conhttp://www.blogger.com/img/blank.giftrolled input project: a skateboard commended by pure grey matter. I've seen simple games that use BCI, but this is the first time I've seen an actual real-world object steered by the power of the mind. A mobile application developer called Chaotic Moon is giving new meaning to the term mobile application with this fun project using off-the-shelf components.